Smelleze® Eco Stall Odor Removal Granules eliminates horse stall smell without masking with harmful fragrances. Horse stall odor doesn't stand a chance. Safe for people, pets & planet. This eco-friendly stall odor removal deodorizer really works to get rid of horse odor, horse smell & horse urine smell. Eliminate Stinky Stall Odors & Moisture Safely! Odor problems in animal stalls usually result from ammonia and mercaptans released by urine and feces. The stench produced is discomforting to both the farm workers and animals. Studies with various animals including horses have shown that even low levels of ammonia are more than just a nuisance problem. It can cause airway defense mechanisms to be depressed, a higher rate of pneumonia, lower weight gains and damage to the respiratory tract. Smelleze® Stall Smell Removal Granules were specially developed to absorb and eliminate offensive urine generated ammonia odors and moisture. Smelleze® Stall Odor Removal Granules will eliminate malodor and moisture in stalls, stables, feed lots, animal pens and trailers. This will create a healthier environment for livestock, reduce fly infestation and thrush, extend bedding life, reduce stall maintenance and result in drier stalls. The latter is particularly advantageous to newborns and sick or injured animals that are confined to stalls. Smelleze® Stall Smell Remover Granules are also a superior solution to lime. It will not sting eyes and nostrils like lime and be dangerously slippery when wet. Furthermore, it will not crack hooves and burn tender foot pads and you only need to use about one third as much as lime. Smelleze® Stall Odor Remover Granules will work better than lime in addition to saving you time and money. As an added benefit, used Smelleze® Stall Smell Control Granules makes an excellent soil amendment and can be recycled as a slow release fertilizer in planting areas due to its nutrient value. Used Smelleze® Odor Control Granules may be applied to gardens, flower beds, yards, fields, potting soil and plant beds. Smelleze® Stall Smell Eliminator Granules are non-toxic, safe, recyclable, natural, odorless, non-flammable and non-caustic. 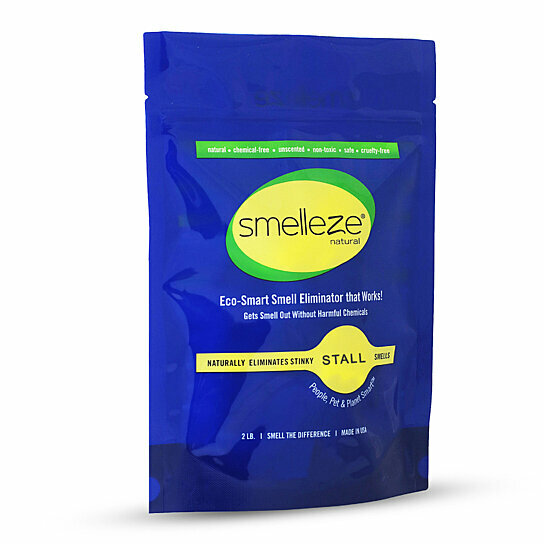 Smelleze® Smell Neutralizer Granules are an ideal environmentally friendly solution for eliminating smelly stall odors and moisture without adding pollutants to the air you breathe. It does not contain VOCs, harmful or ozone depleting chemicals and is especially beneficial for those suffering from allergies and chemical sensitivity. No fossil fuels are used in the production of Smelleze® odor eliminator deodorizer media.